It’s hard for me to believe that Nora is old enough to notice what holiday it is and if she gets a present or not–but this Easter I had to face the facts. Since Blake is pretty adamant that Nora not eat candy (and I’m not actively encouraging candy either), I wanted to make her something special that would take her mind off the lack of chocolate eggs. 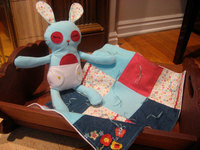 This little bunny and her blanket are made from this mmmcrafts pattern, and are sewn from some of Nora’s outgrown baby clothes. I used felt, embroidery floss, thread, and batting that I already had, so the only thing I had to buy was the pattern itself. My dad made the cradle for me when I was a baby, and my mom brought it up from Spring City so that I could pass it on to Nora. Tender, right? I mean, I’m pretty much the best mom ever, wouldn’t you say? Unfortunately, my gift was completely overshadowed by the gigantic pink plush Care Bear Nora’s great-aunt bought her at a secondhand store. Nora tackled that thing and rolled around with it, giggling and giggling. Ah, well. Maybe this sleepy little homemade bunny will grow on her. This entry was posted in Crossovers, Easter, Lisa by lisa. Bookmark the permalink. You are an AWESOME mom. And I’m jealous of Nora’s bunny. And I predict that it becomes a treasured toy. Nay, and heirloom. and=an. Feel free to edit my comment if the mood strikes.